Horizontal Autoclaves, manufactured by Abster Equipment are smart investment for hospitals and laboratories, where large volume of sterilization is required. Designed ergonomically, our range of high pressure horizontal autoclave sterilizers is ideal for academic facilities, biotech industries, pharmaceutical industries, hospitals, research centers and food and beverage industries. These units efficiently meet stringent sterilization requirements and well suited for sterilizing hospital dressings and surgical instruments, rubber and plastic goods, glassware and utensils etc. Abster Steam Sterilizers are ideal for Hospitals, Research Laboratory and other Pharmaceutical Industry. They are designed for safe & efficient sterilization of various items such as Ampoules & Vials, Rubber goods, empty flasks, instruments & utensils, Fabrics wrapped or unwrapped, etc. 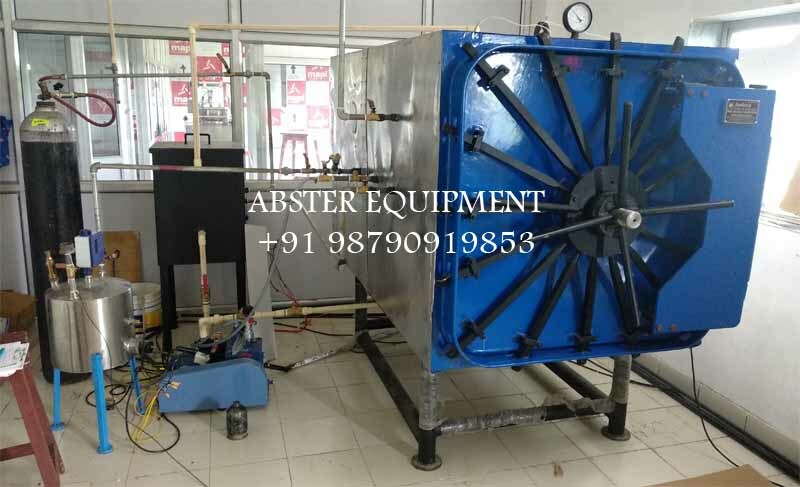 The chamber is constructed of heavy duty stainless steel 316 to with stand pressure of 2.2 Kg/cm2 corresponding to temperature of 1340C and also to with stand vacuum of 650-700 mm (26"/28") of Hg. in Chamber. Two rails are provided in the chamber bottom for easy loading & unloading of the material on Carriage. 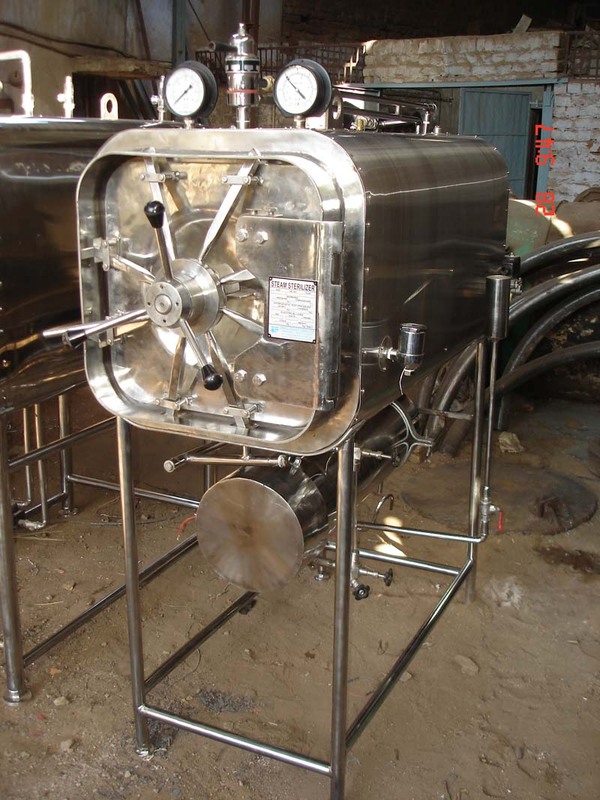 The Sterilizer is supplied with single door or double doors made of 304/316 S .S. The doors are having automatic sliding type arrangement OR Manual Hinge type doors. The doors will have unique arrangement to open them manually in case of power failure. The door Gasket will be of Silicon Rubber. b) When one door is open the other cannot be opened (for Sterilizer with 2 Doors). * The piping is of stainless steel 304/316. The Sterilizer is operated by steam supplied from the central boiler or by in -built electric steam generator. Autoclave can be supplied with 304/316 S. S. steam generator operable on electricity. It has safety features such as low water cut off, pressure control etc. 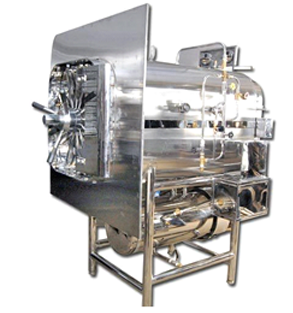 This system is used for effective air removal from Autoclave chamber. It consists of efficient of water-ring type vacuum pump, condenser etc. The control unit is based on advance PLC or Microprocessor technology. This unit control different sterilization cycles with the help of in -built different program combinations. Control unit is provided with manual operation facility. Autoclave can be supplied with stainless steel removable shelves/trays or with a loading carriage & trolleys. The loading carriage is made of stainless steel 304/316. And it has adjustable shelves which can be positioned according to Height of the goods. It is designed to slide easily from chamber to trolley. The trolley is made of S.S.lM.S. and its base has four heavy duty castors. For liquids in bottles and PVC pouches with the help of air and/or with the help of water spray after the end of sterlization period. It can manufactured to comply with any other international standard/s. for units operated by steam supplied from the central boiler. We also offer any other chamber dimensions/specifications designed for special applications/requirements. We reserve the Right to alter, Modify, Improve or Change the Design of our Products as Result of continuous Development.